Wash the basil and mint leaves. For the best result, blend all ingredients in a powerful stand blender. The very first time I was introduced to pesto …well, I honestly have to say I didn’t like it. The taste of it was so unique and new to me that I wasn’t sure what to think about it. I haven’t tasted anything similar before. There are certain types of food with a very authentic, original taste that are hard (at least for me) to like from the very first moment. I had this same problem with olives in the past. Luckily I don’t give up as easily and slowly I got to use to pesto’s taste. I even became a big fan of this brilliant and versatile sauce. If you have a blender, it’s so effortlessly easy to make your own pesto from scratch. 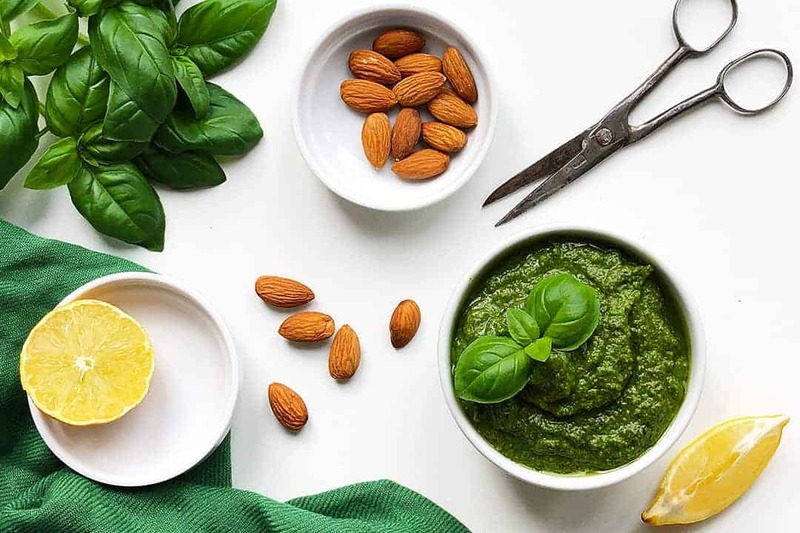 But the best thing about pesto is that you can experiment with the different components and substitute the classic ingredients and replace them with spinach, kale, parsley, walnuts, hazelnuts, almonds etc. 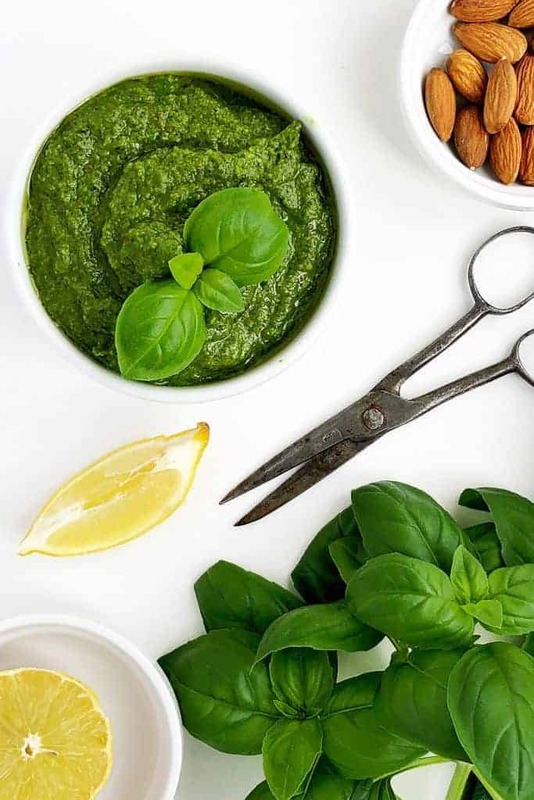 In this pesto variation, I combined fresh basil with mint leaves. I replaced expensive pine nuts with almonds and I completely skipped adding any cheese. All in all, this pesto is easy to make, it doesn’t use expensive ingredients and it’s good for vegans or anyone who is a dairy sensitive. As you can see pesto is quite versatile so don’t be afraid to experiment. What goes well with pesto? A combination of pesto mixed with pasta is loved by all. It’s the quickest pasta meal to make and these two go together exceptionally well. Pesto also pairs nicely with chicken or fish (especially salmon and cod) and it tastes great on bread and pizza. 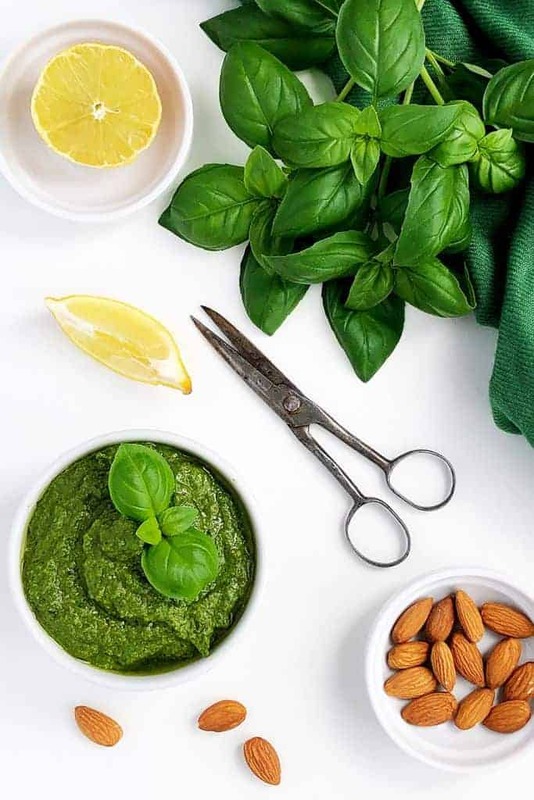 Except for these commonly used combinations pesto is good with other less typical meals, like mash potatoes, nachos (I love to spoon a few drops of pesto over my nachos to give it some extra taste), gnocchi, wraps and even tomato soup. How long does homemade pesto last? You can store pesto in the fridge for up to a week. Anything longer isn’t recommended for homemade pesto. Yes, pesto is safe to freeze. 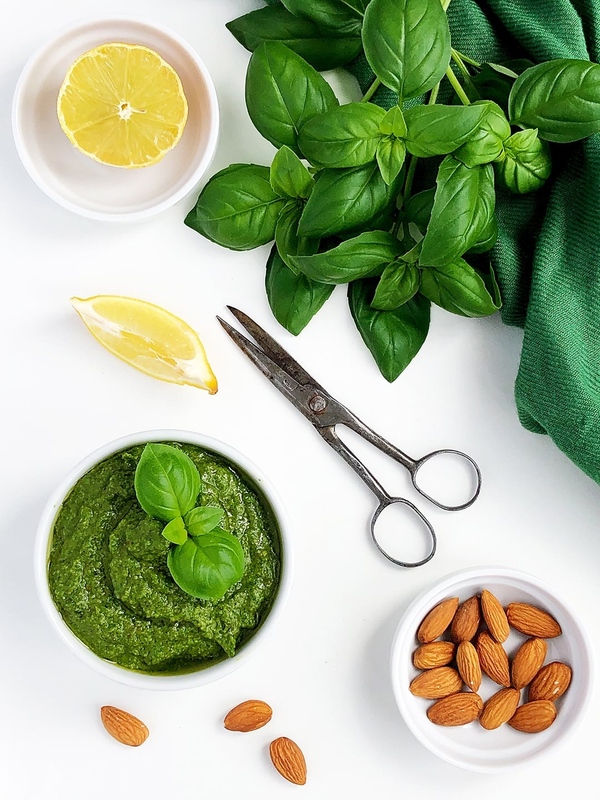 Frozen pesto should be used within 3 – 4 months. Some people will argue whether to freeze pesto with or without cheese. Apparently, the quality and taste of frozen pesto with cheese will suffer and the texture might become more grainy. As my recipe doesn’t have any cheese in it, I am covered here. The most popular method for freezing pesto is using a mould for making ice cubes. You fill the mould, let it freeze for a few hours. Once frozen tip all cubes into a resealable freezer bag and put back to the freezer. The other clever method of how to freeze pesto is from thekitchen.com. They spread the pesto evenly on a shallow tray lined with baking paper and let it freeze. Once frozen they cut the frozen sheet of pesto with a knife to random pieces and store in resealable plastic bag or airtight container.